All the horses! All the facts! This glorious book gives you the lowdown on 37 beautiful horse breeds, with profiles, stickers and stunning equestrian photos. From the tiny Falabella to the spirited Arab and sturdy Fjord pony, make friends with them all! 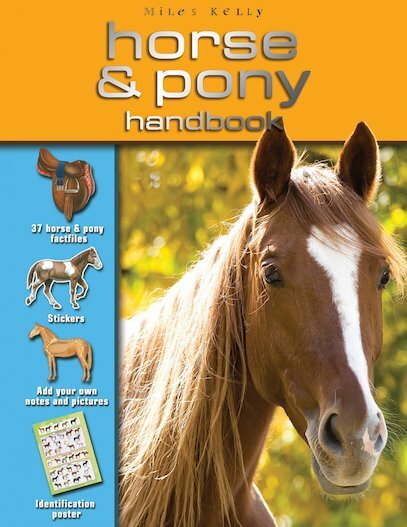 Guaranteed to make any horse-lover’s pulse gallop, this handbook has everything you need to know about horses and ponies great and small: vital statistics, identification tips, stickers to record your breed sightings, and space for your own notes. You can learn all about horse and pony care, tacking up and horse anatomy, and you’ll also find cool weblinks, an identification poster, and breathtaking images from world-renowned equestrian photographer Bob Langrish! This is an ok book to read if you go horse riding or if you are lucky and own a horse. The weblinks are good and i liked the poster. I think it was really a good book…if you have not tried it you should its really good…but that is my honest opinion.